IALA never looked to whom they should nominate as the Grand Marshal. 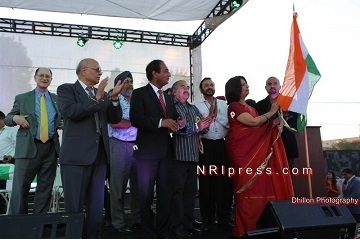 Close to 8000-10,000 people came to celebrate India's 67th Independence Day function in Granada Hills Charter High School on Saturday, Aug 17. 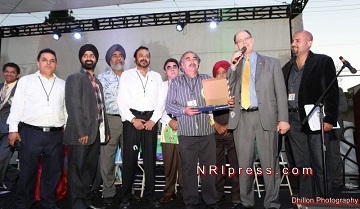 The function was organized by (IALA) India Association of Los Angeles ( San Fernando Valley). There was overwhelming participation from the people who started coming at 4 PM for health check-up at health fair. Four physicians, two dietitians, three nurses and several volunteers greeted the patients who came for consultation or check-up. Lions Club provided a van fully equipped for eye check-up. Cultural program started at 6 pm. This year, IALA did not repeat their last year’s mistake of bringing high ticketed 2nd rate Bollywood singer. Simar and Kavita reached out to local artists – and there were plenty – who entertained the audience uptill 10 PM. The dignitary included India’s ambassador, Nirupma Rao, Consul General of India, N. Parthasarathi, Congressman Brad Sharman, District Attorney, Jackie lacey and several others representing local elected officials. Los Angeles County District Attorney JACKIE LACEY was sworn in as District Attorney on Dec. 3, 2012 and oversees roughly 1,000 lawyers, nearly 300 investigators and about 800 support staff employees. Sunil Agrawal conducted the Raffle and distributed prizes to the Raffle-winners. Raffle was sponsored by India Sweets & Spices and Emirates Airlines. A new young team of executives with good teamwork brought professionalism & enthusiasm to the organization, which was reflected in the successful completion of the event. Vineet Puri of IALA spoke about the sacrifices of Gadar heroes and ambassador Rao paid rich tributes to the Gadar movement as the movement started by NRIs to free India from the British slavery. "We should all work together for the progress of India and the US," said Dr. Surinder Singh." We are calling for the unity among all the Indian community members, no matter from what region of India you come from, no matter what your language is, and no matter what your faith is, you must realize that you are an Indian."